LG is a South Korean electronics and home appliance brand that has a wide range of products in its portfolio. Having its presence in refrigerator arena, LG delivers an extensive variety of refrigerator models to the users with any budget. The popular ones among these are the single door fridges, which come with advanced technology and elegant designs. LG single door refrigerators come with smart inverter technology that saves more power and ultimately your monthly bill on electricity. Regarding the star rating, these LG refrigerator single door models come with 3-star or 5-star rating for their energy efficiency. The built-in stabilizer and reciprocatory compressor add to the efficiency of the fridge. For those who are craving for more space, LG single door 290 ltr and 270 litres will satisfy you regarding space and design. 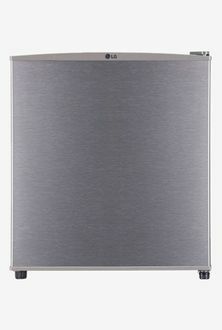 LG refrigerator 235 ltr single door models are top-notch regarding the design and features. The key features of these models include smart inverter, built-in stabilizer, direct cool and affordable price tag. Power-cut Evercool range of refrigerators from LG saves you from the power cuts, which is common in rural India. Get to know what are the models available in this category from the LG Evercool refrigerator price list. If you are impressed by the features, here is the LG single door refrigerator price list that contains 42 models as on 25th April 2019.